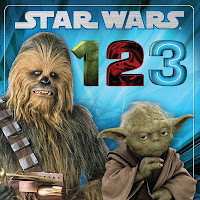 A counting book based on Star Wars - a great way to introduce your children to some of the characters from your favorite movies. Start their geek credentials early. Each number is a two-page spread with amazing illustrations and a short sentence to reinforce the number. Learn about Star Wars and numbers at the same time. Another fun book about Star Wars for the next generation! Scholastic has been bringing out a lot of different books from Lego Star Wars, Star Wars activity books and now Star Wars Phonics and a counting and numbers book.